I love rust. Its no secret. When I see a piece of rusty wire, no matter how bad its condition, my heart skips a beat. I found this old piece of messed up rusty wire out the back of our property somewhere and picked it up. It was pretty mangled. No way to unravel it, so I did the next best thing. 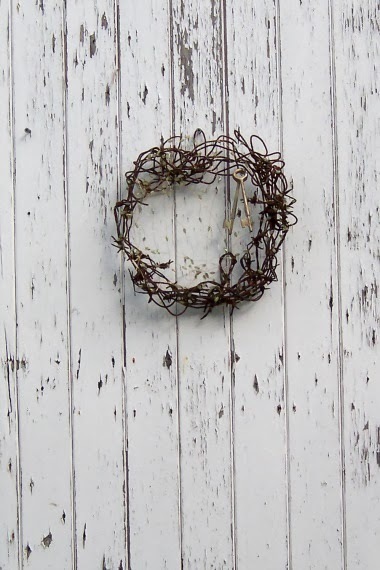 I weaved it into a circle, added a few bits of rusty barbed wire and called it a wreath. You can see how it looked in its first incarnation here. I lived with it like that for a while but it just wasn’t … finished. It needed something… more. It needed a strand of wire with glittery green beads on it. And a couple of aged keys. 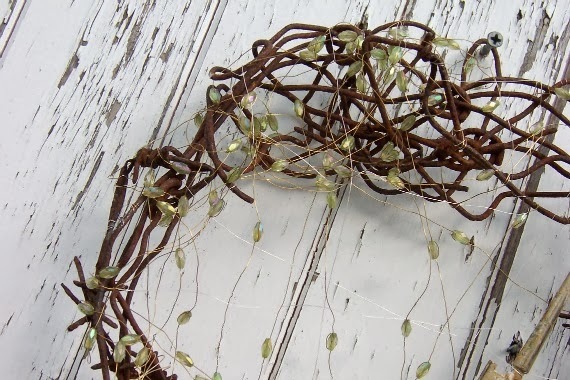 The wire with beads was given to my by a friend who said ‘I thought you’d be able to use this’… how right she was! 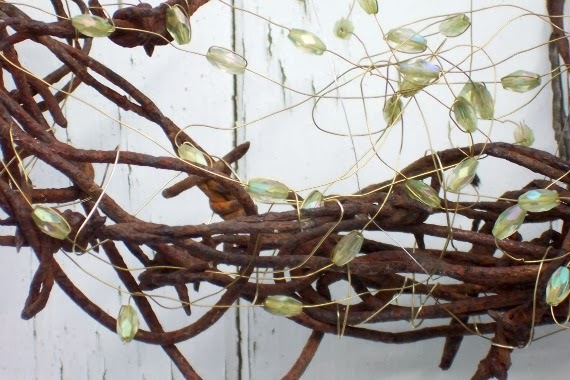 I love the shine of the gold wire and the sparkle of the beads against the flatness and colour of the rusty wire. I love the tangles of the wire. I’d say its finished now… it just works! PS On an aside, the ‘search this blog’ link isn’t working… I have no idea why. It used to work! 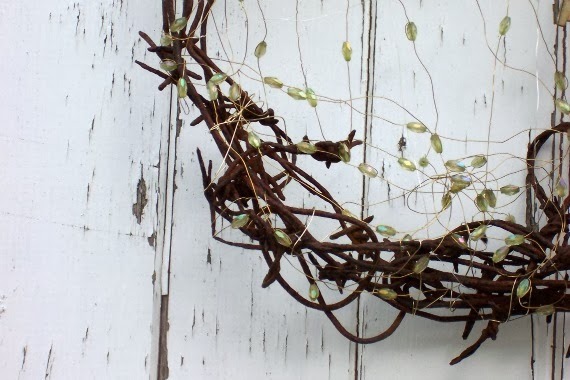 This entry was posted in Craft, DIY, rustic, thrifting by zefiart. Bookmark the permalink. 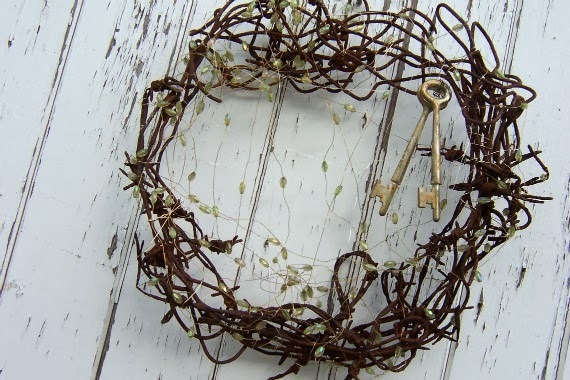 Zefi, I LOVE this wreath ! 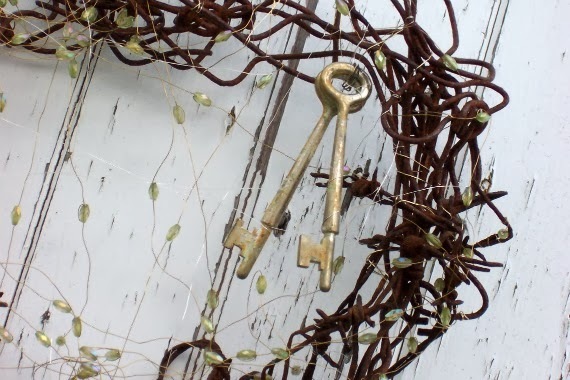 When I read how your heart skips a beat when you find something rusty…. I knew you were my kinda gal! I'm the same way! When we travel, if we stop beside the road for anything, I'm walking up and down the roadway looking for anything rusty. Have found many goodies, but just never seem to know what to do with stuff when I get it home. I know each piece will eventually find it's way into something! I really like this wreath and think that I might have to make one of my own. I found this when I was looking at how to make the tin can crown. I'd like to try this since I have a statue in the garden that needs to have a crown on her head. Thank you for the great ideas ! Thanks for your comments Patty. Did you see my 'danlges'… For some reason my search button isn't working or I could give you a link to it.